Paper Cut is the latest installment compiling the works of artists in this edgy Echo Park space curated by Subliminal Projects aka ‘LA Art God’ Shepard Fairey. This is the third time I have seen Fairey at an event and finally got to shake his hand and let him know my excitement for finally getting to his gallery space. Today The Art World recognized Shepard and Amanda Fairey as one of the 10 LA art power couples alongside many other creative forces making a difference in the art world. 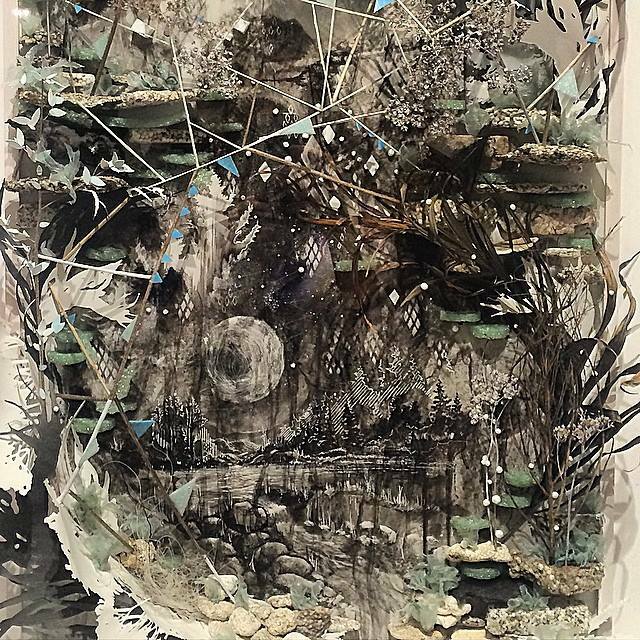 The exhibition Paper Cut features six artists who cut into, tear into, and deconstruct the humble, traditional medium of paper to explore the terrain of their subject matter. Opening night on March 7 drew an eclectic crowd who swooned over pieces from Adam Feibelman, Aurel Rubbish, Bovey Lee, Gregory Euclide, Nicola Lopez, and Swoon. 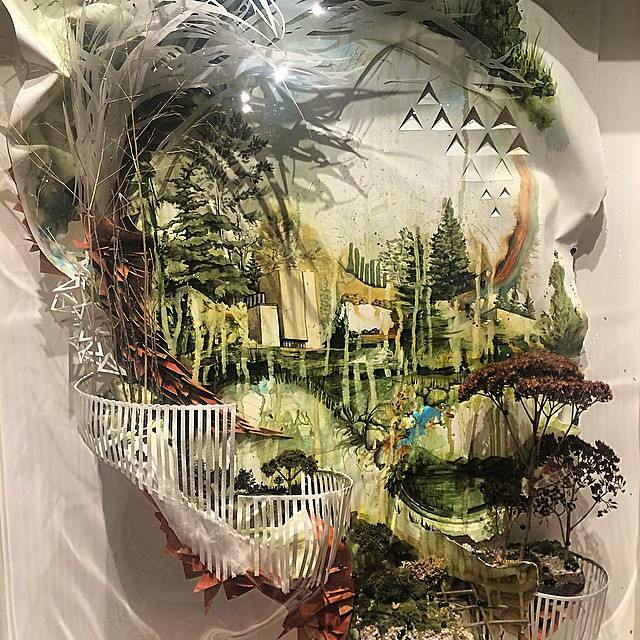 Each artist hails from a different city, drawing inspiration from distinctly different places and translating their ethos in dramatically unique and signature ways. Subliminal Projects showcases the artist Nicola Lopez. 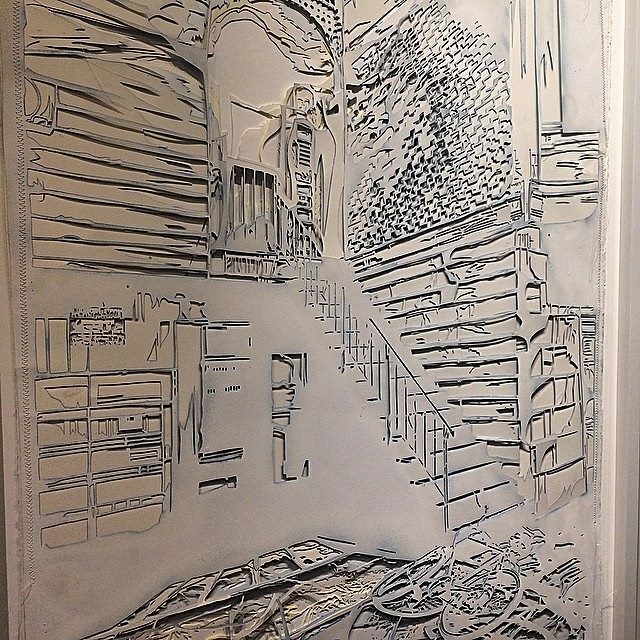 The graffiti artist Adam Feibelman shared with me how he layered his stencils and stitched them together to create his grand size multiple cutout piece. Nicola Lopez had me questioning perspective as her geometric principles collide and the viewer looks up into the skyscraper sky. The artist collages etchings and woodcuts combined onto the medium from which each is cut. 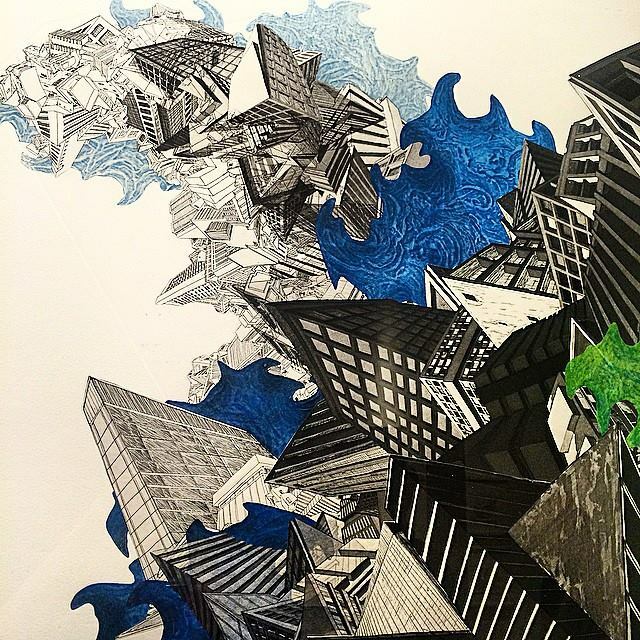 Artist Adam Feibelman layers and stitches the reverse side of his paper cuts from his graffiti art. Don’t miss this unique space entitled Paper Cut (close to the Thai restaurant Night+Market) that runs til April 11. Gallery hours are Wednesday through Saturday from 12 to 6 pm. Shepard and Amanda Fairey continue to host and curate exhibitions featuring artists such as Ryan McGinness, HunterGatherer, David Ellis, Doze Green, Aesthetic Apparatus, Space Invader, Jim Houser and Andrew Jeffery Wright. SUBLIMINAL PROJECTS is a multifunctional gallery space promoting diverse forms of art while providing a forum for contemporary dialogue. Originally created by Shepard Fairey and Blaize Blouin as an artist collective in 1995, the group played an integral part in introducing skateboarding culture and design to the art world, showcasing artists such as Phil Frost, Thomas Campbell, Mike Mills, Dave Aaron, and Mark Gonzales. We wonder what Subliminal Projects with important messages and creative expressions will pop up next, in the year 2015. 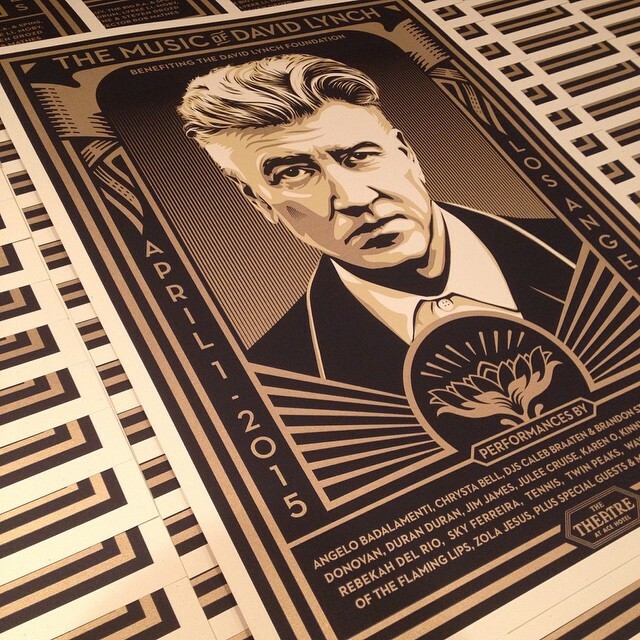 All photos (except for David Lynch) are courtesy of Melissa Curtin.